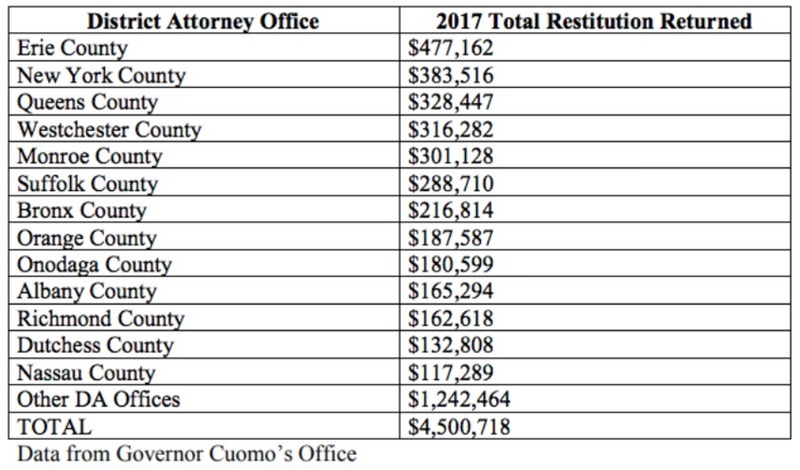 Governor Cuomo's Office has announced the Erie County District Attorney Office returned the most in illegally obtained unemployment money in the state in 2017. The Erie County's Special Investigations and Prosecutions (SIP) Bureau returned $477,162 in total restitution from unemployment fraud cases last year. In 2016, the SIP Bureau recovered $363,195 in illegally obtained money. According to the D.A. 's office, unemployment fraud is the most prevalent crime against state revenue. Once fraud is suspected, the cases are turned over to local authorities. "I am proud to have our office partner with the Department of Labor in investigating these case. When you cheat the state, you cheat every law-abiding taxpayer in New York," said D.A. Flynn.